Estadio Azteca was built in the 1960s to accommodate the growing support of Club América and to provide Mexico with a flagship venue for the upcoming 1970 World Cup. Estadio Azteca got designed by architect Pedro Ramírez Vázquez after a careful study of the most famous European stadiums of that time. Construction of the stadium, which took a total of 4 years, was not easy due to the hard volcanic rock the land consisted of. Estadio Azteca officially opened on 29 May 1966 with a friendly match between América and Italian side Torino (2-2). During the 1970 World Cup, it hosted a total of 10 matches, among which a semi-final and the final between Brazil and Italy (4-1). Sixteen years later, Estadio Azteca again hosted a World Cup final, and until 2014 it had been the only stadium to host two World Cup finals (now sharing the honour with Maracana). The stadium had received a small refurbishment before the start of the World Cup, and went on to host 9 matches, among which the famous quarter-final between Argentina and England (2-1), a semi-final, and the final between Argentina and Germany (3-2). In the following decades, safety measures brought back capacity from 115,000 in 1986 to around 100,000 in the 2000s. In 2016, the stadium underwent a large refurbishment including the addition of VIP facilities, which reduced capacity to 84,000 seats. 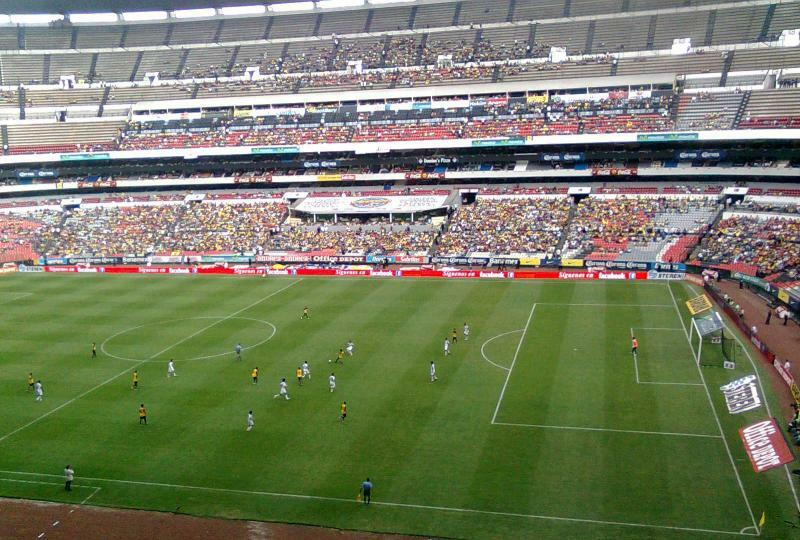 Apart from being the home of América, Estadio Azteca is also a regular playing venue for the Mexican national team. Over the years, it has also been the home of various other Mexican clubs, such as Cruz Azul and Necaxa. Estadio Azteca is located in the south of Mexico City, about 15 kilometres from the historic city centre. The stadium is easy to reach by metro and the connecting light rail. First take metro line 2 (which crosses the city’s historic centre) to its final stop Tasqueña, and then transfer to the light rail (tren ligero), which has a similar look as the metro, but for which a separate ticket is required. Get off at stop Estadio Azteca. If arriving by car, the stadium can be reached by driving all the way south over the large Avenida Tlalpan (which originates in the historic centre). Stay on the right side of the metro and light rail tracks, and the stadium will automatically show up on your right. Alternatively, the stadium can be reached from the Anillo Pereférico ring road, which passes just south of the stadium. Take exit Estadio Azteca. There is a lot of parking at the stadium, but expect to get stuck in traffic. Estadio Azteca is located in a predominantly residential area, and there is little entertainment around. The area north of the stadium is a bit seedy, but there is no reason to venture there. Of course, you can always get a quesadilla outside the stadium at one of the many stalls before the match. Hotel La Luna is a basic option close to the stadium as is Hotel Real Azteca, but these really only will appeal to those who need something close to the stadium and travel in and out. A little further away, but still at walking distance (though you might prefer a taxi), the Fiesta Inn is a nice option. It is located next to Gran Sur shopping centre. The Holiday Inn Medica Sur is another decent option at similar distance. There are, of course, a lot of hotels in Mexico City’s historic centre, from where you can easily catch metro line 2. Slightly more upscale are the areas around the Avenida Reforma, including the lively Condesa, Polanco, and Roma areas with their nightlife), which are also packed with hotels. You need an extra metro change though to get onto line 2. Tickets for Club América matches can be bought online via Ticketmaster, at the ticket windows (taquillas) at the stadium, or through one of the Ticketmaster sales outlets. Tickets can also be bought at the gates of the stadium on the day of the match. Due to the size of the stadium, América rarely sells out. 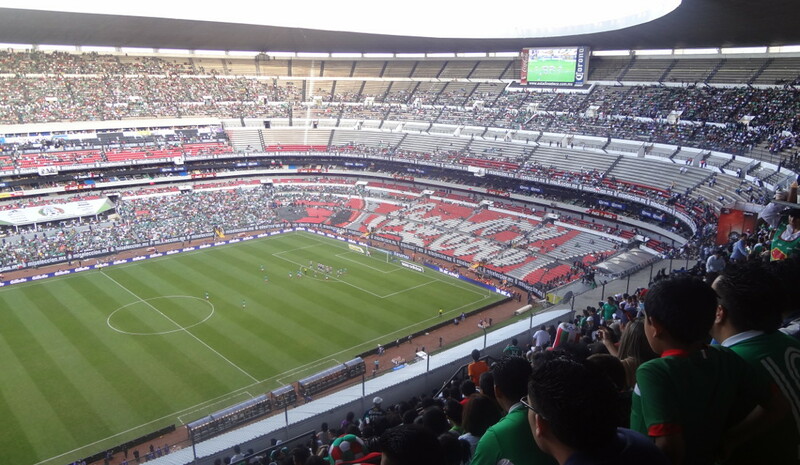 Prices will depend on the opponent, but for a typical league match upper tier seats tend to go for MX$ 100.00, and lower tier seats for MX$ 200.00. Prices are increased to between MX$ 200.00 and MX$ 500.00 for a few high-profile matches. Estadio Azteca offers guided stadium tours that include the press room, home dressing room, players tunnel, and dugouts. The tour lasts 30 to 40 minutes. Tours run Mondays to Fridays at every half an hour between 10:00 am and 5:00 pm, and Saturdays and Sundays between 10:00 am and 2:00 pm. There are no tours on matchdays or the day before a home match. Bookings are not required. The tour costs MX$ 105.00 per person. Clubamerica.com.mx – Official website of Club América. Esmas.com – Official website of Estadio Azteca. In March 2012 we took the Estadio Azteca stadium tour. We had previously checked by phone whether it really was not necessary to make a booking, which they indeed confirmed. The stadium was easy to reach by metro + light rail, however, as it is located in the far south of the city, it still took some time to get to the stadium. You’ll definitely need 30 to 45 minutes to get there from the historic centre, though it would be wise to calculate some more time, especially when it rains. The entrance to the tour was somewhat unclear as it was not at the Club América-Nike store right at the entrance (as seemed logical), but on the right side of the stadium (as from the metro station). The guards that were around were helpful enough to point us in the right direction though, and we arrived at the VisitStadium boutique just in time for the 1:00 pm tour. After buying our ticket we were sent down to wait at a cafeteria with some food and drink options. The previous tour had just come back and seemed rather packed with about 30 people, however it turned out that we were only 6 for our tour (which was apparently rather unusual based on the reaction of our guide). The guide was a rather young bloke, probably a student, but very friendly and could answer most questions. He seemed a tad nervous though, so it may have been one of his first days on the job. The tour started with a walk outside the stadium, then turned inside through the marathon tunnel, passed by the press room (located in the tunnel), went into the América dressing room, and continued through the players tunnel to the pitch. Then there was some time on the edge of the pitch to take photos (of course no stepping onto the pitch allowed), and have your photo taken by the guide (which he printed out for free later). Then finally we walked back up the stands and inside to the cafeteria. All in all it lasted only about a good 30 minutes. Overall the tour was definitely interesting, but it felt kind of short. Most stadium tours last at least an hour. For one it would have been nice to view the stadium from up the stands. We only saw the interior from around pitch level. It also might have been nice to see the business facilities, control room, and other behind-the-scenes areas. Right now it really was the bare minimum. So a very nice experience, definitely worth the metro ride, but a bit too short.